Where do you go when you need foreign currency for your holiday? Do you go to your bank, post office, a high street currency dealer, or order online? Before deciding where to get your holiday money I highly recommend you check out Martin Lewis’s TravelMoneyMax.com. He’s the guy who runs the Money Saving Expert website, and is regularly on UK TV giving advice on saving money. On the TravelMoneyMax website you enter how much of what currency you want, and the site will tell you the best place to get it. 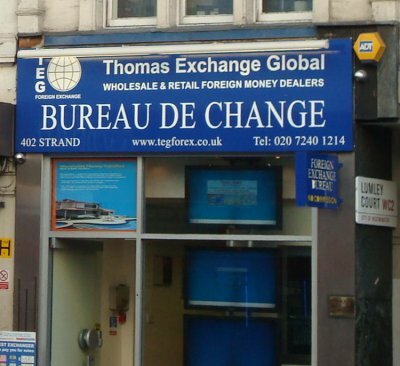 One of the places that is always near the top of the list is the Thomas Exchange Global currency dealer at 402 Strand, WC2R 0NE in London. I’ve been to the Thomas Exchange Global quite a number of times to get various currencies. Here is my review of what their service is like when you visit the exchange in person to buy currency. I’m not reviewing any of their other services. The shop itself is on the North side of the road on the Strand. It is a very small premises so you’ll have to be careful not to walk past it. There are about three counters in the shop, but this seems to be enough as they are very quick. Ask them what price they will give you, and if you are happy with the rate, give them your money. Once you tell them how much foreign currency you need, the person serving you passes this information onto a backroom member of staff. The backroom staff get the foreign currency ready while the counter staff member counts up your own money. When I’ve requested smaller denomination notes they often haven’t been able to get them for me. But as long as you are happy with whatever denomination bank notes they give you Thomas Exchange Global do a good job. They always count your original money out in front of you. If you give them a reasonable wad of notes they’ll then put it through a note counting machine to count it again. They’ll then bring your foreign currency over, and count it out in front of you. They’ll do this at least twice. They don’t accidental want to give you too much! To finish up they’ll give you a receipt, and give you your foreign money in an envelope. If you are exchanging a large amount of money then I’d recommend you carry your money in a money belt to make sure you don’t lose it. And to make it less likely that it will get stolen. This is a very busy area of London and you could easily get mugged if an opportunist thief saw you walking out with a big bundle of bank notes. Thomas Exchange Global official website. This entry was posted on Monday, April 19th, 2010 at 7:40 am and is filed under Money. You can follow any responses to this entry through the RSS 2.0 feed. You can leave a response, or trackback from your own site.